For many women there is little that can be done to alleviate the physical and mental stress caused by Pre Menstrual Syndrome. In the case that you cannot alleviate PMS symptoms with either Western or herbal medicines it is well worth seeking alternative ways to cope. Primarily this will involve an acceptance of the stresses and pains you experience and meditation can help you to do this. Additionally meditation is believed to be capable of directly alleviating pain in some cases, though this will most likely occur through an adoption of a positive mental attitude through meditation, rather than a concerted effort to wish away the pain. The symptoms of PMS are wide and varied, the most common being anxiety, depression, tiredness and headaches. One of the most outstanding problems with PMS is its regularity and its uncontrollability. Meditation can both help with the direct symptoms and an acceptance of its inevitability. For many women who suffer from serious PMS, which can last for up two weeks, the question often asked, understandably, is why me? Unfortunately, this is a question to which there is no useful answer. By meditating, however, it may be possible to better accept what for many people is an uncomfortable reality. Meditation, being useful for relieving stress, as well as relieving the direct symptoms of PMS can help to alleviate the overall anxiety caused by PMS. As many PMS symptoms are stress related, learning to control stress in general can only have a positive effect on PMS. The joint build up of everyday stress can otherwise serve to significantly aggravate the PMS syndrome. Meditating to relieve PMS is much like meditating in general. 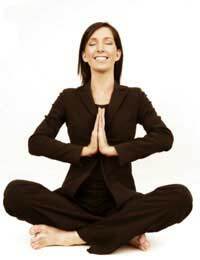 However, you may wish to carefully consider the form of meditation you choose to pursue. If you are specifically meditating to relieve PMS symptoms it may not be wise to undertake an intense spiritual course of meditation, unless you desire to. A simple clearing of the mind by focusing on your breathing, a mantra, or a positive affirmation (see related articles) will suffice if you simply want to alleviate stress and pain. At the same time, given the focus of your meditation, it is essential to not strongly focus upon your PMS symptoms when meditating. Rather, it is advisable to ‘let go’ of your symptoms by accepting them as they arise and abate. One major pitfall may occur as a result of not wishing to meditate at your lowest points, or not feeling the need to when you feel at your highest points. PMS naturally lends itself to one needing to develop precisely the frame of mind that meditation intends to foster. Rather than exclaiming joy when you feel at your best or bemoaning your fate when you feel at your worst, it is possible to see both extremes of happiness and depression as equal impostors that can be lived with and experienced as and when they arise. The process of meditation, by instilling a deep focus on the moment, through the counting of breaths, or the reciting of a phrase leads one to live in the moment and let it pass naturally without unduly resenting it or grasping hold of it.